Baltz and Sons Concrete - Project Profile: Memphis Botanic Garden Memphis, Tenn.
Project Profile: Memphis Botanic Garden Memphis, Tenn.
Home/Project Profile: Memphis Botanic Garden Memphis, Tenn. The project originally given Kevin Baltz, president of Memphis, Tenn., company Baltz & Sons Concrete Services, was a lot simpler than the one he ended up with. “I was first approached to do some hardscape and subbase for a network of brick or paver stone terraces,” he recalls. “The connecting walkways were going to be asphalt.” He can’t hide the disdain in his voice when he makes that last statement. The project was a new herb garden, a pocket of about three-quarters of an acre graciously carved into the 96-acre Memphis Botanic Garden. The undertaking, which began to take shape late in 2010, was the latest of the Botanic Garden’s 23 specialty gardens located in the heart of the city and predicted to become the largest herb garden in the South. So did a little numbers crunching. Baltz demonstrated with a calculator how he could handle the entire job — walkways, a footbridge over a slight natural swale, and multiple terraces — for about 60 percent of the hardscape budget set aside for the entire job. There’d be plenty of room in the budget to convert that dreaded asphalt walkway to pervious concrete. 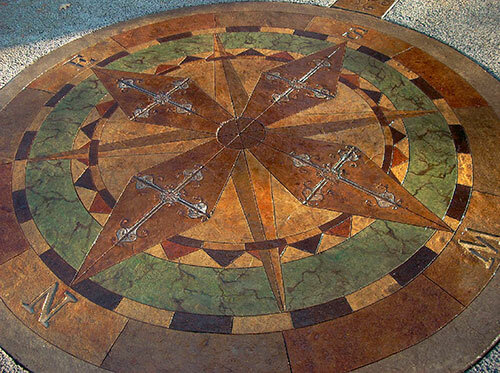 Baltz’s most detailed work was in the compass rose design stamped into the presidential slate terrace. After pouring the textured mix, he used a GPS to align himself directionally and pressed in wrought iron scrollwork for ornamentation. He used rubber matte templates for directional letters and coated the surface with five or six different acid stains. He also used custom acrylic stains with powdered metallics and a sealer infused with metallics for a glittery finish. 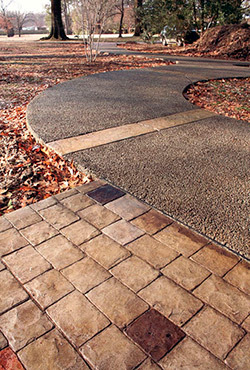 He credits the use of Buckeye UltraFiber 500 as a secondary reinforcement in the concrete for the visual appeal of his terraces and walkways. In addition to reducing shrink cracks, the cellulose supplement “pulled in the pigment. It takes colors in so well that it made a dramatic aesthetic difference,” he says. 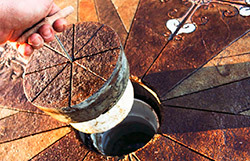 In the center of the compass rose stamp is a hidden vault. Guests at the Memphis Botanic Garden can follow clues hidden throughout the garden to find it. The connecting tissue between all of these various terraces is the pervious concrete walkway. The use of this material was critical since the paths would thread through tall old-growth trees. Pervious concrete was the greener choice, by far, over asphalt, which would have blocked proper drainage to the root system below. When water can’t get to roots, the roots go in search of water, buckling hard surfaces in the process. That need for proper drainage also affected the stain choice. 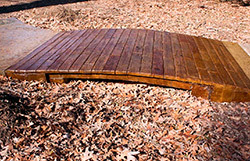 Baltz’s normal course of action on a walkway would have been to use an acid stain with a high-solid sealer, but that would have blocked water run-through. So he used a low-viscosity water-based stain from Tru Impressions that had such a high concentration of pigment that he didn’t have to use a sealer at all. Furthermore, the pervious concrete provided a better-gripping surface, making it ADA-compliant and an aid to canes, walkers and wheelchairs. What could be more natural for an herb garden walkway than the inclusion of herbs? It was the client’s idea to include the relevant thematic visual cue, so Baltz chose to run a periodic crossbands, stamped with actual herbs, across the width of the pervious concrete walkway. It was a painstaking job to stamp real herbs into his creation, but well worth it. The Memphis Botanic Garden’s Herb Garden is a welcoming patch of serenity that actually came in under budget — an added attraction in these challenging times.